Mitek CEO Jim DeBello stands in front of a bank vault at the company’s headquarters in downtown San Diego. The company, formerly headquartered in Kearny Mesa, leases about 29,000 square feet in the office tower at 600 B St., in downtown San Diego. The building formerly housed a bank, and Mitek retained its vault when it remodeled the office. Photo by Jamie Scott Lytle. San Diego  On the internet, nobody knows you’re a dog — or so goes the early 1990s adage about online anonymity. For companies conducting business online, that’s a problem. 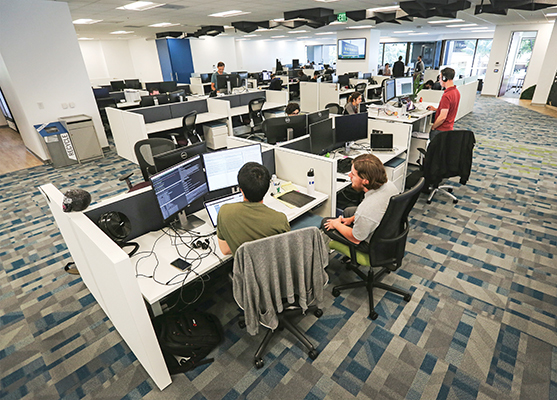 It’s one that San Diego software company Mitek Systems has developed algorithms to help solve. It is a new use for the technology Mitek has been deploying in the service of financial institutions since the early 2000s. CEO Jim DeBello says the growth of its ID verification services will spur the company to greater than 30 percent revenue growth this year and continue to broaden its customer base into new industries and geographies. Mitek was founded more than 30 years ago around technology it bought from HNC Software, the fraud detection company that was founded by a UC San Diego professor and later acquired by FICO. For years it provided back-office data security services to the U.S. government, shielding communications at outposts, such as embassies worldwide. But when the Cold War ended, so too did those government contracts. When DeBello was hired in 2003, the company had nine employees, he recalls. DeBello introduced Mitek’s flagship product, which uses imaging to allow banks to offer customers the options of depositing a check remotely by taking a photo of it with a smartphone. Mitek has more than 100 employees of its total workforce of 369 people based in San Diego. The company’s corporate headquarters are located downtown. Today about 6,200 banks, including the top 10 in the U.S., use that technology; Mitek processes billions of checks yearly. And that business isn’t slowing: DeBello said it continues to grow 15 percent to 20 percent yearly. The company today has more than 300 employees worldwide. But it’s the deployment of identity verification solutions that DeBello believes will fuel even more rapid growth in years to come. “We think we hit a vein to leverage the technology into a new use case,” DeBello said. Businesses that are looking to transact with customers online and want to confirm their identification can use Mitek’s algorithms to confirm whether the ID they provide is authentic, and whether it belongs to the person providing it.